Posted by randydeutsch in Ambiguity, architect types, books, change, collaboration, problem solving, questions. Summary: You don’t need to be a designer to benefit from the best practices espoused in this magnificent new book. A must-have for designers, but also for those in project management and anyone who works with designers. 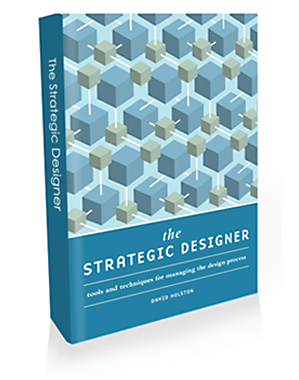 Based on over 100 interviews with designers, researchers and educators, The_Strategic_Designer by David Holston provides an overview of the design process and best practices. The Strategic Designer: Tools and techniques for managing the design process, published by F+W Media and HOW Design, is billed as a Strategic Graphic Design Thinking book. Despite this categorization, the subject matter transcends graphic design and can be universally applied to any of the design trades and professions including product and environmental design. As designers look for ways to stay competitive in the conceptual economy and address the increasing complexity of design problems, they are seeing that they must not only be experts in form, but must also have the ability to collaborate, to design in context and be accountable through measurement. By adopting a process that considers collaboration, context and accountability, designers move from makers of things to strategists. The book focuses on the designer’s workflow, ideation techniques, client relationships and methods for measuring the success of their projects. An excellent foreward by Shawn M McKinney gets things off to a fast start – which, alone, is worth the investment in the book. Each chapter covers a specific design phase emphasis, providing a practical step-by-step approach, complete with tools and techniques. The Collaborative Designer – emphasizing co-creation, communication, mutual benefit, respect and trust in a strong client-designer relationship. This is a particularly rich chapter, addressing and answering such questions as: What makes a Good designer? What Makes a Good Client? and Clients to Avoid. There’s a wonderful sidebar on: Seven Principles for Managing Creative Tension. Designing with the End User in Mind – with an emphasis on facilitating and moderating participatory and collaborative work sessions. The Designing for People chapter focuses on research as a valuable tool for gaining insight into the organizational needs of clients and their prospective audiences. Managing Ideas – especially when ideating with others in a participatory or collaborative setting, relying heavily on the experiences and knowledge of people involved. Making Strategy Visible – how the designer takes an empathic approach to design that connects business goals with user needs. Planning in a Turbulent Environment – the days of using a linear design process are over. Strategic designers face increasingly wicked problems. A helpful framework offered by project management. Refining Your Process – so it can provide a common understanding for “how things get done” mitigating wasted efforts while creating value for the client and user alike. Holston’s text anticipates your questions and concerns and places each topic in a larger context. He is clearly in control of his subject. The author places the book and subject squarely in Dan Pink’s Conceptual Economy, a term describing the contribution of creativity, innovation, and design skills to economic competitiveness, especially in the global context. In his book A Whole New Mind, Daniel Pink explains how the economy is now moving from the information age to the conceptual age. Later in The Strategic Designer, Rotman School of Management dean Roger Martin says that the world is moving from the Information Economy to a Design Economy. A small distinction, but one that unnecessarily complicates matters. I would look to a book such as this to clarify the playing field, at the very least to acknowledge that the labeling of epochs and phraseology are still a work-in-progress. The book’s strength is not in creating new knowledge – but in repackaging what is largely already known, experientially by every designer – in an easy to carry tome. Readers, for example, who have perused Wikipedia articles on various topics related to design strategy will recognize the source of several of the author’s summaries. In this sense, the book is not a product of the Conceptual Age, but instead is a well-designed, convenient and accessible agglomeration, aggregating both explicit and, perhaps the greater achievement here, tacit knowledge on the subject. The book is no less of an achievement for doing so. The design world is a much better place for having this book at its disposal. Conclusion: The Strategic Designer is a must-have book for designers, those who manage design projects and those who work with designers in a collaborative setting. Addenda: How can this book not have a single review? HOW books makes books on high quality paper, books that feel good in the hand, and themselves serve as exemplary reminders that ebooks should not be our only option. The Strategic Designer is no exception. See this short video with author Dave Holston presenting the introduction to The Strategic Designer Brand and here on competitive strategy.